Ennek a teljesítményorientált összteleszkópos e-bike-nak a segítségével könnyen legyőzheted a technikás terepet. Trail-ekre tervezett geometriájával a Stance E+ megmutatja a kezdő és középhaladó kerékpárosoknak, hogy milyen is az igazi terepkerékpározás. A könnyű és erős ALUXX SL váz FlexPoint felfüggesztéssel könnyen legyőzhetővé teszi a trükkös singletrack-eket is. A rugóút hátul 120mm, elöl pedig 130mm, mindez fürge 27.5+ kerekekkel párosítva. A SyncDrive Sport motor 350 % rásegítést nyújt. A RideControl ONE integrált kezelőegység ergonomikus gombokkal rendelkezik, míg az 500Wh-s akkumulátor segytségével hosszabb túrákat tehetsz. Az új okos töltővel pedig hamar fel tudod tölteni. A SyncDrive Sport motor 80Nm nyomatékot és 350 % rásegytsét nyújt, így könnyen legyőzheted az emelkedőket. A 120mm-es FlexPoint felfüggesztés trail és XC terepre lett tervezve. Az 500 Wh-s akkumulátor a lehető leghosszabb hatótávolságot nyújtja, mindezt nagyon szépen az alsócsőbe integrálva. Designed with trail-friendly geometry, the new Stance E+ helps beginner or intermediate riders experience off-road E-bike riding at its best. Its lightweight, strong and stiff ALUXX SL aluminum frame with FlexPoint suspension makes tricky singletrack trails easier to ride. It features 120mm of rear suspension travel and 130mm up front, plus the stable, nimble ride quality of 27.5+ wheels. The SyncDrive Sport motor delivers 350 percent support ratios. The RideControl ONE integrated handlebar support buttons offer ergonomic control, and the Downtube EnergyPak 500Wh battery system lets you extend the ride. And now you can charge it up quickly with a new smart charger. The 4-sensor system precisely measures the amount of force a rider is applying to the pedals so that the motor can produce a seamless power boost. SyncDrive Sport powered by Yamaha is designed for high-performance E-bike riding. Giant tuned the motor to be more powerful for performance-focused riding. A proven “single-pivot” design that uses the flexing action of the chainstay/seatstay junction to produce a lightweight and durable suspension system with 120mm of rear travel. This updated EnergyPak is mounted in the downtube of our E-bikes and has smart features to deliver the safest and longest lasting EnergyPak experience. Helps riders power through variable off-road terrain with an E-bike optimized chainring, chain and rear wheel. A proven “single-pivot” design that uses the flexing action of the chainstay/seatstay junction to produce a lightweight and durable suspension system with 4.7 inches/120mm of rear travel. Innovation, manufacturing expertise and a motor system powered by Yamaha all combine to expand any rider’s abilities. SyncDrive Sport offers three support modes and is equipped on E-bikes that are used for both everyday riding and for more demanding off-road riding. This small mid-drive motor delivers a massive maximum 80Nm of torque and is widely acclaimed for its performance and reliability. The PedalPlus 4-sensor technology system combines speed and torque sensors with motor and pedal rotation sensors to produce consistent power across the entire gear range. It precisely measures the amount of force a rider is applying to the pedals so that the motor delivers a seamless power boost. 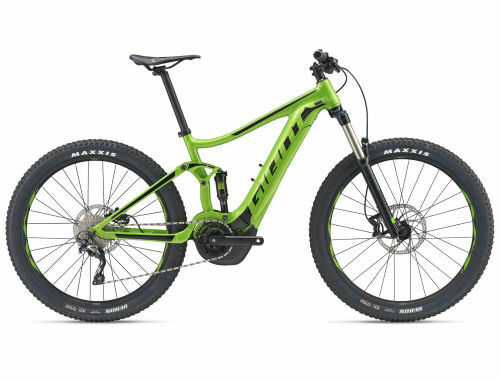 Giant Unveils New Full-Suspension Trail E-bikes!